Today marks the 30th anniversary of the cinematic release of Mel Brooks' satirical comedy entitled Spaceballs. The genre of the film is similar to one of its predecessors, The Holiday Special, and subsequent Star Wars-themed comedic episodes in Robot Chicken and Family Guy. The majority of the scenes and characters are parodies of Star Wars, although it parodies other movies as well including Star Trek, The Wizard of Oz, Planet of the Apes and Alien. The spoof's release came ten years after the first Star Wars film was screened across movie theatres in America and like George Lucas' 1977 hit the spoof has yet to lose it's charm thirty years on. Interestingly, George Lucas got a chance to read the script before production began, and loved it so much that he decided to have his special effects company, Industrial Light and Magic, help make the film. 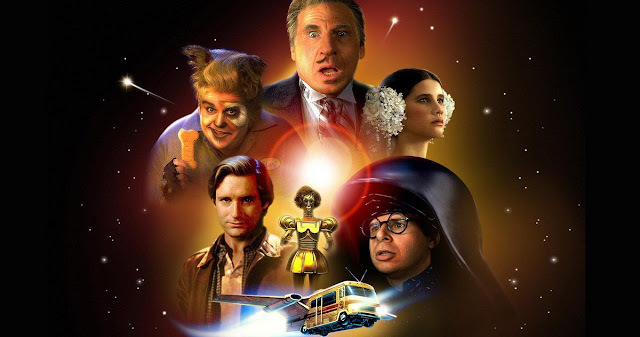 In September 2004 a sequel to Spaceballs was announced in an interview with Mel Brooks. The director hoped the movie would come out around the same time as the theatrical release of Star Wars: Episode III - Revenge of the Sith. However there was no evidence a sequel was being worked on as of June 2005. An animated series, called Spaceballs: The TV Series was later announced. Thirteen episodes aired, with Mel brooks directing, writing, and voice-acting alongside original actors Daphne Zuniga and Joan Rivers. The series premiered on G4 on September 21, 2008. What is your favorite moment from Spaceballs? Let us know your thoughts in the comments below.